For the 50,000-plus Loons fans at last Sunday’s match, the club is more than a team to cheer for. The only thing that was missing was the snow. March 12, 2017 had the snow, and that completed the experience. 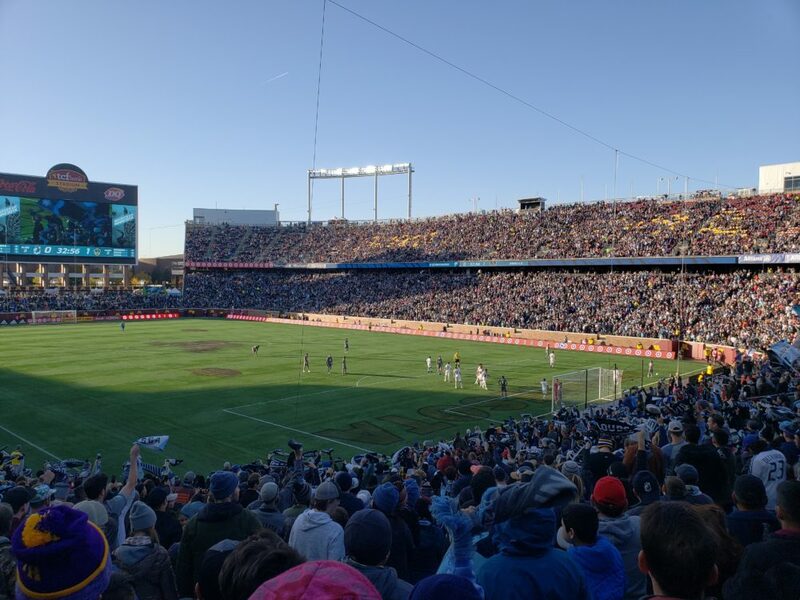 It was that day that the Minnesota United kicked off Major League Soccer action at home in front of 35,000 fans adorned in hats and jackets at TCF Bank Stadium in Minneapolis. Fast forward 19 months and the Loons’ rental of the stadium on the campus of the University of Minnesota went out with a bang. 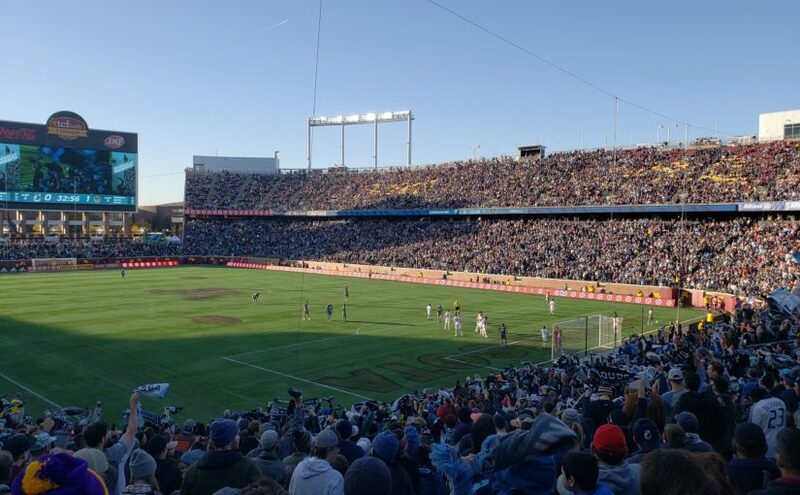 Over 52,000 fans made their way into the stadium last Sunday, as MNUFC faced off against the Los Angeles Zlatans. The Galaxy came in with slim playoff hopes and played that way against a Loons side already eliminated. But the on-field product was not the talking point of the day, but it was the everything around the match, the reason why it feels good to be a soccer fan. A record-breaking crowd, a potential to crush playoff dreams, cheap food, the list can keep going. Don’t get this wrong: the Loons are purely a Minnesota team, just like Twins, Vikings, Timberwolves and Wild. Expectations? You go into the season with some and get disappointed in the final product. Questionable front office decisions? Seeing the new star signing Angelo Rodriguez perform in a single game was enough to convince the team to sell Christian Ramirez, a fan favorite from when MNUFC were in a lower division. The former finished with just three goals. At least the front office found a serviceable holding midfielder in Fernando Bob. But the difference is that for the fans of the Loons, or pretty much any soccer team, everything is personal. Remember back in the NFL offseason, New Orleans Saints running back Alvin Kamara bluntly said “F— Minnesota”? He did, and will Vikings fans jeer him on every touch of the ball on Sunday? Probably not. Cue Galaxy forward Zlatan Ibrahimovic. In the lead up to the match, the 37-year-old claimed he would play on the turf because 50,000 people don’t show up to Loons game. “Obviously, they don’t have this crowd every home game, so I’m sure they’re not coming for Minnesota. So, I come and I make them enjoy,” Zlatan said. Being soccer fans, everyone let Zlatan hear it. “If I wanted to watch an old man, I would have watched golf” read one sign. “I didn’t come to see Zlatan, Zlatan came to see me” read another. And then the best of them all, a glitch on the video boards. As the Galaxy’s lineup was announced, Zlatan’s picture was inexplicably missing. During the match, the loudest roars of the crowd, not including when MNUFC had a pair of goals ruled offside, came when Zlatan, of Manchester United, Paris-St. Germain and AC Milan fame, went up against Woodbury, Minnesota native Brent Kallman. It was, especially in early aerial duels, advantage Woodbury. But anyone who has seen an MLS game with Zlatan knows how the story goes. Of course, the Swede got the last laugh. The opening goal came as the big striker ghosted off the back of Minnesota center back Michael Boxall and nodded an easy header home. His assist to Ola Kamara to seal the game was better. A perfectly curled ball in behind the Minnesota backline gave the Galaxy a 3-0 lead. But throughout the game, the feeling in the stadium was energetic. The supporters in the Wonderwall were loud throughout and made the game different from any other sporting event. Next year could be even better, even if there won’t be 50,000 fans. Minnesota United move into a brand-new nest at Allianz Field in St. Paul. The 19,700-seat stadium will be cozy, but that is part of the atmosphere. Hopefully the on-field product will be better. That remains to be seen, given the true Minnesotan nature of the team.